I recently had a project where I needed a capability to store BLOB’s in the cloud to meet some requirements of having a fast download speeds, scalable infrastructure and cheap storage & access of various different types of BLOBs my my client. I turned to see if Azure had some tools such as Microsoft Azure Storage,that could help me out. Obviously with the release of Microsoft Azure Storage, users will need a mechanism to access and interact with their data. 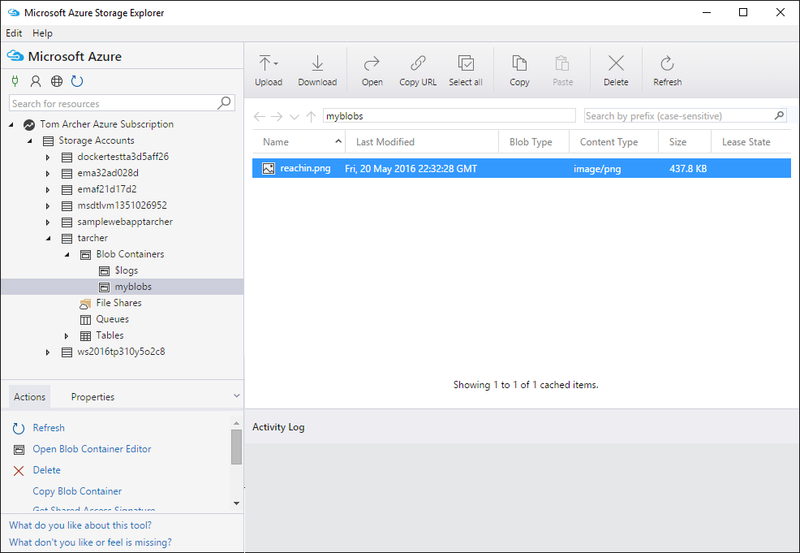 Microsoft Azure Storage Explorer is a nifty little tool that let’s you interact with your uploaded Azure resource data in an explorer like format. Microsoft also provides other free Microsoft Azure Storage Client Tools to interact with Azure Storage data such as the Microsoft Azure Portal itself and Microsoft Visual Studio Server Explorer.